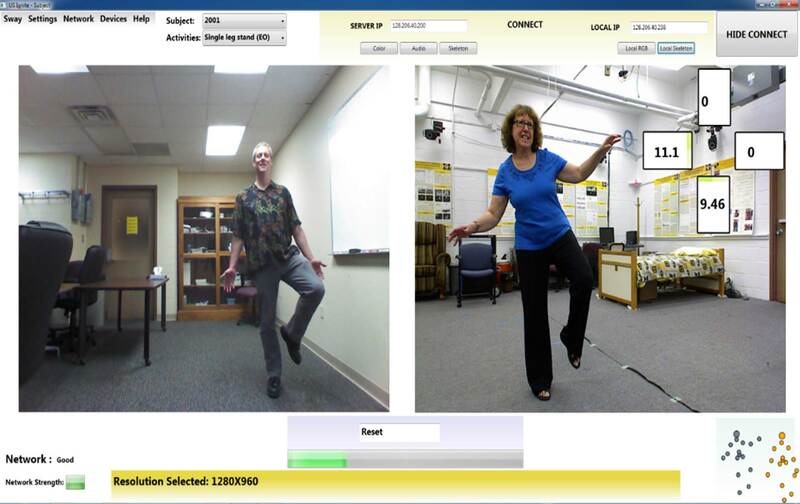 Develop an integrated, interactive interface for displaying in-home gait history and coaching remote users on proper exercise form. Extend the integrated system to support “GENI-slice” overlay network channels. Deploy the integrated monitoring and coaching system in senior independent living homes in Kansas City and evaluate the usability, user satisfaction, and effectiveness. In-home sensors hold enormous potential for identifying early changes in health. The proposed project addresses the US Ignite vision of using flexible, high speed, low latency networking to solve real-world problems. This project tests interactive coaching concepts with remote deployment of sensing, high-definition video-based communication, and interactive interfaces leveraging hybrid computing using GENI Racks and GENI-slice overlay network channels for remotely located clinicians. The networking infrastructure between Columbia and Kansas City that leverages the Internet2 Innovation Platform and connectivity to GENI infrastructure will provide software-defined networking capabilities, bandwidth and latency requirements essential for our proposed project. We have developed an interactive physical therapy system (IPTS) for remote quantitative assessment of clients in the home. The IPTS provides a real-time low latency video conference using audio, video, skeletal, and depth data streams from a Microsoft Kinect. 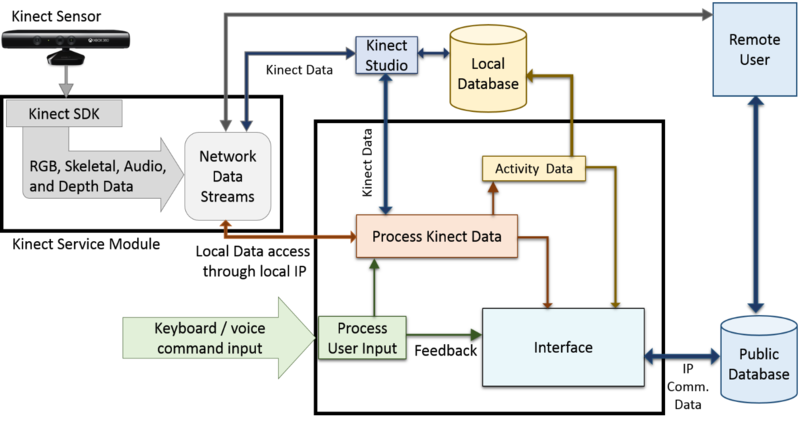 The system consists of two interactive interfaces, one for the senior in the home and another for the therapist in the clinic connected through a network, for a real-time low latency video conference using audio, video, skeletal, and depth data streams from a Microsoft Kinect. The application interfaces were developed with iterative feedback provided by a therapist with an active clinical practice. 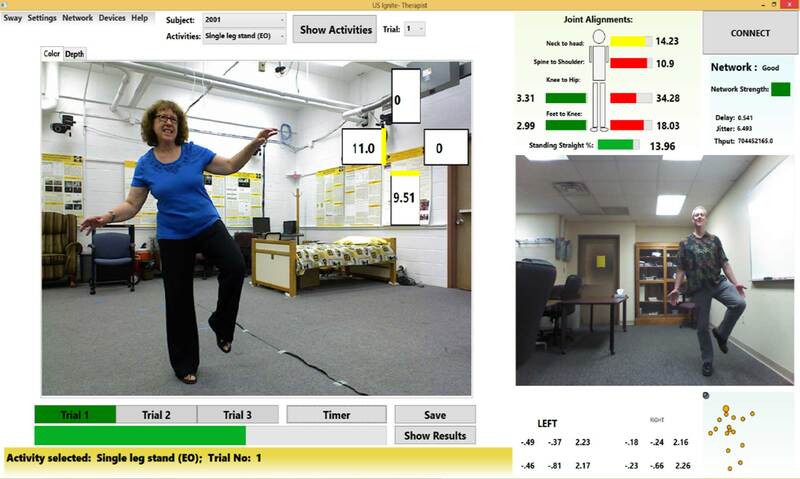 The therapist’s interface window provides real-time visual feedback of kinematic information measured from the Kinect skeletal data. This includes the anterior-posterior (AP – front to back) and medial-lateral (ML – side to side) trunk sway, full body joint alignments, a real-time view of the client’s skeletal model, and the status of the network. A result window displays the post-activity assessment for all the activities and trials, including a top-down view of the horizontal L5 motion and the maximum AP and ML trunk-sway. Additionally, the therapist’s interface supports a set of voice commands to interact with the application, improving user experience. However, the in-home interface has a relatively simple interface to help the senior focus on the activity without distraction. The in-home interface window includes a timer bar that indicates the time left to perform a particular activity and live trunk sway feedback that helps the senior to maintain a better form as she performs the activities. These unique features of the IPTS combined with a basic video and audio communication makes it more than just a video conference system. To test the potential of IPTS, experiments were conducted with 5 independent living senior subjects in Kansas City, MO. Mishra A, Skubic M, and Abbott C, “Development and Preliminary Validation of an Interactive Remote Physical Therapy System,” In Proc., IEEE Conf of the Engineering in Medicine and Biology Society, Milan, Italy, August, 2015. Skubic M, Mishra A, Harris B, Abbott C, Craver A, Musterman K, and Rantz M, “HCI Challenges for Consumer-Based Aging in Place Technologies,” In Proc., Intl. Conf. on Human Aspects of IT for the Aged Population, Toronto, Canada, July, 2016. M. Singhal, J. Ramanathan, P. Calyam, M. Skubic, “In-the-know: Recommendation Framework for City-supported Hybrid Cloud Services”, Proc. of IEEE/ACM Conference on Utility and Cloud Computing (UCC), pp. 137-145, 2014. P. Calyam, A. Mishra, R. B. Antequera, D. Chemodanov, A. Berryman, K. Zhu, C. Abbott, and M. Skubic, “Synchronous Big Data Analytics for Personalized and Remote Physical Therapy,” Pervasive and Mobile Computing – Special Issue on Big Data Analytics for Smarter Health Care, June, 2016, vol. 28, issue C, pp. 3-20, available on-line, Sept. 28, 2015.